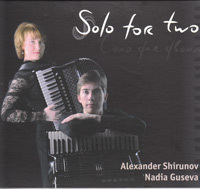 "Solo for Two" - is the first CD of the accordion duo from Saint-Petersburg - Alexander Shirunov and Nadia Guseva. The duo was formed in 2003 while both musicians were students at the Rimsky-Korsakov State Conservatory of Music in Saint-Petersburg, studying with Professor Alezander Dmitriev, an Honored Artist of Russia. Each of them has gained international recognition as a soloist, by winning the highest prizes at several prestigious International competitions such as "Citta di Castelfidardo" and "Citta di Lanciano" (Italy), "Coupe Mondiale" (Denmark, Great Britain, Portugal), "V.I.P. World Accordion Show" (France), "Primus Ikaalinen" (Finland), and more. Aspiring to be reconized as a professional ensemble, Alexander and Nadia took part in two International competitions: 'Voices of Spring' (Moscow, 2005) and 'Citta di Castelfidardo' (Italy, 2006), - winning First Prize at both. With each artist having such an outstanding musical personality, it is no wonder that their brilliant and expressive ensemble playing immediately captivated the audience, while receiving the highest marks from accordion professionals. 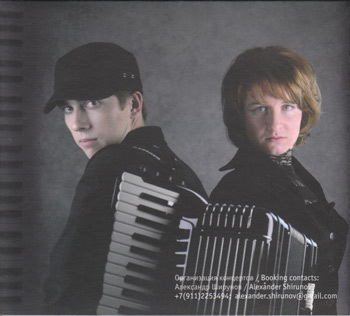 This dynamic duo of accordionsts engage in an intensive concert schedule both in Russia and abroad, where they perform at various International musc festivals. 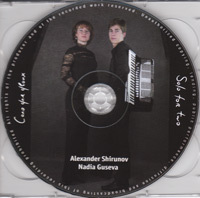 The worlds's top German based accordion magazine 'Intermusik' wrote: "Alexander Shirunov and Nadia Guseva becamenstant favorites of the public thanks to their unrepeatable performances that earned them highly positive critical acclaim." (reported after their concerts in Vilnius, Lithuanian). 'Colourful sound', 'orchestral dynamics', 'precise rhythm, masterfully expressed in unison playing' - are some of the comments that can be found in reviews by German, Lithuanian, and Norwegian journalists. Performing a diverse repertoire ranging from classics to jazz to contemporary, the two musicians continually seek to widen their repertoire, enabling them to expand and broaden their rich creative potential. 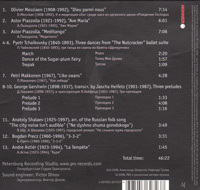 The program fo "Solo for Two" is the result of srupulous and profound workin striving for a perfect sound while achieving full comprehension of a composers's intent. The chosen repertoire highlights the versatility of each artist's technical and creative skills. With the exquisite refinement of the smallest details, their interpretatios offer a new sense to well-known compositions, while highlighting a wide dimension of musical forms. They breathe as one and a duo becomes a "Solo for Two".